We prefer to be on the cutting edge of everything paid search related. Why? Because we like to push the boundaries and are never happy with the status quo. What does that mean for you? It means that you’ll have a digital ad agency that will always work to do better than they did the month before. What that really means is more conversions and more sales and who doesn’t want that? PPC or Pay Per Click is a form of digital advertising used to direct traffic to a website where a fee is charged when the ad is clicked on. That’s a simple enough definition but there is more to it than just that. There always is isn’t there? At 3GEDigital we start with the end in mind, the conversion. The conversion, whatever it may be, it could be a phone call, a download, a lead form submission or even a video view and we build our campaigns around it. From there we assign KPI’s, or key performance indicators, that support the conversion. All before we create one campaign. For instance, if you judge your success by a successful eCommerce purchase, then so do we. If success to you is a phone call, a newsletter registration, visiting a specific page, or downloading an app then that is how we’ll measure our success. You see, PPC isn’t one size fits all. 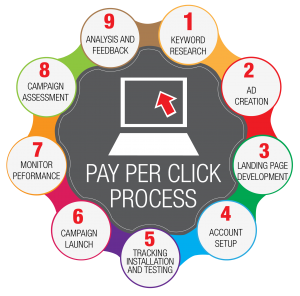 Sure, we run many different PPC campaigns and because of that we bring a tremendous amount of insight with us but the fact of the matter is, each business is different. Each location is different. So, if you spend $1,000 per month or a $1,000,000 we start in the same place, how do you measure success? We focus our PPC campaigns on all three, ensuring that our campaigns are relevant, get clicks and convert. This is part of our ongoing campaign optimization, we’re not a set it and forget it shop. We understand the subtle complexities of running PPC campaigns and understand that the only constant is change. Which is why we will live in your account, making changes, testing ad copy, assigning keywords (both positive and negative), testing landing pages and more. All to ensure that you get the highest possible ROAS (return on ad spend). We work smart. We focus on best practices, put in the work, focus on strategy and pay attention to the data. There isn’t any special sauce that one PPC agency has over the other. There isn’t a silver bullet, but there is intelligence testing. What that means is that we make ongoing judgments based off of data. We don’t cut corners and we always do it the right way. Not 99% of the time, but 100% of the time. True, it takes more work (for us, not you), but as an end result your campaigns will perform better and your budget will work harder.